Dental emergencies can happen to anyone, so when it happens to you it’s important to know what to do and where to get help urgently. When you contact Eastwood Dental with an emergency, we attend to your urgent appointment as quickly as possible. Once the dental concern is fixed, we will schedule a follow-up appointment with you for a complete and thorough examination, ensuring all your dental needs are identified and addressed. If you are experiencing severe toothache or pain from a cracked, broken or chipped tooth due to traumatic injury or if you have lost a filling, contact Eastwood Dental immediately on 9874 9900. It’s important to remain calm during a dental emergency and contact us as soon as possible. We will book your appointment as soon as possible and provide you with instructions on what to do while you wait. 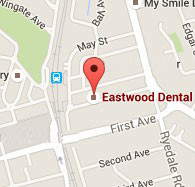 Call Eastwood Dental on 9874 9900 to book your emergency appointment.